There are two sides of Masahiro Tanaka. The one that's most visible is the fiercely competitive, all-business pitcher who shows up on game day locked in and ready to win. He's the guy who thrives in the spotlight, the one who Manager Joe Girardi trusts with the ball in the biggest spots. "He's a guy that is so professional," said teammate Ivan Nova. "He just has a really good idea of what he's doing --"
Before Nova can finish the thought, a shirtless Tanaka bounds through the clubhouse doors and stumbles ever so slightly as he bangs into the corner of a laundry cart. "Atta boy, Maas!" Nova shouts across the room, unable to conceal his laughter. On days like today, when Tanaka is not starting, Nova describes the 27-year-old Japan native as "the funnest guy ever." Yet, the Yankees' ace right-hander barely cracks a smile. He shoots Nova a bemused look that seems to say, "Go ahead and laugh. I'll get you back." "You can see him right now -- that's who he is," Nova said, before feebly attempting to convince Tanaka that he broke the laundry cart and must buy a new one. "That's his personality right there. My man." Tanaka gave Nathan Eovaldi a similar look a couple days earlier when he breezed past Eovaldi's locker wearing street clothes. "Hey man," a fully uniformed Eovaldi said, "4:15 stretch today." Tanaka glanced up at the clock: 4:16. Eovaldi has been around some great starting pitchers in his career. Jose Fernandez in Miami. Clayton Kershaw in Los Angeles. As dialed in as they are on days they pitch, there is a need to release some steam on the days in between. Tanaka is no different. "He can take a joke," Eovaldi said. "You've just got to be sure you can take one, too, because he's gonna give it back." It's been two-and-a-half years since Tanaka arrived from Japan aboard a Boeing 787 Dreamliner that he chartered for himself, his wife and their toy poodle. His understanding of English "has progressed in a way that's pretty spectacular," said his interpreter, Shingo Horie. But since he's not quite ready to do interviews in English, and since most of the ones he does through Horie are centered on his game-day performances, the American public rarely gets a glimpse at the human side of Tanaka -- the one who playfully sends flying projectiles across the dugout toward anyone within range, the one who stealthily fills an unsuspecting teammate's hood with sunflower seeds. Together, the two sides of Tanaka form a complete person who is genuinely beloved by everyone around him. But even as he grows more comfortable in his new home, there's one thing about Tanaka that will never change. He'll never stop trying to get better. Some tough experiences along the way made sure of that. "So, how are your diaper-changing skills?" Without needing translation, Tanaka laughs at the question being posed to him over lunch. He is relaxed, seated next to a window, wearing a black polo shirt and sporting a black Hublot watch. Two nights earlier, he suffered his first loss of the season despite allowing just one earned run over six innings at Toronto's Rogers Centre, lowering his ERA to 2.78 through 11 starts. 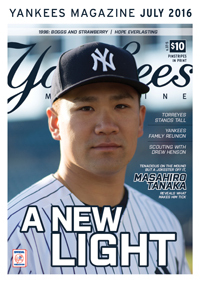 With his next turn in the rotation not scheduled until the Yankees return home to face the Angels, Tanaka graciously accepted an invitation to talk about life away from the ballpark, which changed dramatically in February, when he and his wife, Mai Satoda, welcomed their first child. "It's hard to describe in words, but the first time I saw him come into this world, I felt a great amount of joy and happiness," Tanaka said, popping edamame pods into his mouth while Horie translates. "It was something that I had never felt before. Obviously, the lifestyle has changed. It's not just about yourself; it's about taking care of your son, too. I think there's a great deal of responsibility there. So, I think just having those thoughts is how I've changed after becoming a father." The happy young family resides on Manhattan's West Side, where the kindness shown by strangers toward a young mother when Mai is out and about in New York City is one example why they have settled in nicely among their surroundings. "I haven't really had a chance to witness this, but my wife has mentioned that, just walking in the city with a stroller, everybody's really sort of caring and willing to help," Tanaka said. "The heart and those sort of thoughts of the people here has been something that has been maybe a pleasant surprise. It's something that you really don't see much of in Japan, by comparison." While fatherhood presents a whole new ballgame for Tanaka, shouldering responsibility is something he has been doing for a long time. It was 10 years ago this August when the eyes of a nation were transfixed on a 17-year-old Tanaka during Japan's Summer Koshien, a national high school baseball tournament that CNN once called "the most emotional sports tournament in the world." Tanaka, a senior, was seeking to do something that had been accomplished only once before, way back in the 1930s: lead his school to a third consecutive national title. He had enrolled at Komadai Tomakomai High School despite the fact that it was located on the northern island of Hokkaido, about as far away from his hometown of Itami as one could go without leaving Japan. Tomakomai did not have nearly the same winning tradition of some of the powerhouse programs around Itami that tried to lure Tanaka, but even as a youngster, he was attracted by the idea of leading a team to glory rather than hitching his wagon to one that was already on the cusp. After pitching Tomakomai to the 2005 Summer Koshien championship -- making it the first school to win back-to-back titles in 57 years -- Tanaka became a national star. In 2006, with history on the line, he had a chance to become a legend. Battling a stomach bug throughout the tournament that rendered him utterly miserable, Tanaka willed his team to the championship game against Tokyo's Waseda Jitsugyo High School. In that game, Waseda's star pitcher, Yuki Saito, who had become known as "The Handkerchief Prince" for dabbing his brow in pressure spots, gave up just one run to Tomakomai. Tanaka, who came on in relief in the third inning, did the same. The 1-1 game was called after 15 innings and, per tournament rules, a rematch was scheduled for the following day. Tanaka did not start in the rematch, but after Tomakomai fell behind 1-0 in the first inning, his coach called for the team's best player. Saito started for Waseda, which nicked Tanaka for single runs in the second, sixth and seventh, building a 4-1 lead as the epic showdown approached its grand finale. In the ninth, Tomakomai rallied for two runs, setting up the most dramatic possible ending: Tanaka at the plate, with the game and history resting on his bat. One thing was certain. Tanaka was not going to go down easy. In that moment, he had a flashback to his days in Itami. There, Masahiro and his younger brother, Yuji, grew up in a middle-class household. Their father, Hiroshi, worked for the camera manufacturer Konica, and although their parents were stricter than most, they instilled in their sons personality traits that remain embedded in their makeup. "Overall, I think that I always try to stay positive. That's the No. 1 thing," Tanaka said. "That maybe comes from my mother. She's always smiling and tries to stay positive. "On the other hand, I'm really precise about certain things. I really dig deep into stuff that I enjoy. And stuff that doesn't interest me, I have absolutely no interest in. I don't even touch it, see it, feel it. That characteristic probably comes from my father." As an eighth-grader, Tanaka played on a strong local club team called the Takarazuka Boys. The talent level was very high in Tanaka's baseball-loving hometown; one of his childhood teammates, Hayato Sakamoto, is currently having perhaps the best season of his 10-year career as shortstop of the Yomiuri Giants. Although Osaka was the nearest major city, the Tokyo-based Giants were on TV all the time, so naturally Hideki Matsui was nearly everyone's favorite player. ("It wouldn't be a lie if I said he was mine," Tanaka said.) The Takarazuka Boys were one win away from being crowned champions of Hyogo Prefecture -- similar to a state title in America -- and Tanaka had the bat in his hands and a chance to be Itami's Godzilla if he could drive in the winning run. Instead, he gave kind of a half-hearted swing "without much intention" that resulted in a foul fly to right that was hauled in for the final out. Game over. Tanaka was devastated. "I think it was from then on that I had a stronger feeling of really wanting to win," Tanaka said. "The competitive fire of really wanting to beat the competition has probably grown inside me from that game. "From then on, I thought that I'm never going to do sort of a half-swing; I'll put everything into what I do on the field." Four years later, with 50,000 fans at Koshien Stadium going wild, and millions more glued to their TVs, Tanaka dug in against Saito. There would be no half-swings this time. If Saito was going to get the best of Tanaka, he was going to have to battle for it. Swinging all the way, Tanaka fouled off the first pitch and whiffed at the second to quickly fall behind 0-2. He fouled off the third pitch, took a pitch for ball one, fouled off a pitch up at his eyes, and then fouled off another offering. On the seventh pitch of the at-bat -- Saito's 948th of the two-week tournament -- Tanaka swung and missed. Game over. He was upset to have lost, but it was nothing like the excruciating pain he felt after the check-swing flyout four years earlier. He walked back to the dugout with his head held high, surveying the pandemonium around him and knowing that he gave it his all. "I just went full-on," Tanaka said. "I gave everything I had to that at-bat. So, afterward, obviously I was upset that we'd lost that game, but there were absolutely no regrets." In Japan, teams have a tradition of celebrating a championship by hoisting their manager up and tossing him into the air repeatedly. Rarely does a player receive the doage treatment. Never had a losing player gotten it. Until 2006. In a show of appreciation for everything that Tanaka had done, Tanaka's teammates lifted him up and tossed him in the air again and again. "I felt like I gave everything that I had through my three years of high school baseball," Tanaka said. "That was my very last game of my high school baseball career, and if we won that game, I would have won it during all of my high school years. But even though we lost that game, I felt like all the pressure was gone now. And I felt like I had absolutely no regrets from my high school baseball career." Like a moth to a flame, Tanaka cannot resist the heat of competition. And the scars from those times when he has been burned have only made him stronger. They continue to fuel his inner fire, propelling him ever forward. From high school, Tanaka went to the pros and as a 19-year-old was given the ball on Opening Day for the Tohoku Rakuten Golden Eagles. By the second inning, he was sitting on the bench in tears, removed from the game after giving up six runs on six hits. But he stayed positive, learned from the experience, and soon became one of Nippon Professional Baseball's most dominant pitchers, lifting a team that had not had much success to new heights. From Aug. 26, 2012, to Oct. 27, 2013, Tanaka recorded 30 wins against zero losses -- an achievement that earned him official Guinness World Record certification. With a chance to end his NPB career on a 31-game win streak and deliver the Eagles' first championship, he took the mound for Game 6 of the 2013 Japan Series against the Yomiuri Giants. The powerful defending champs could smell their 23rd title. Tanaka, despite throwing 160 pitches in the complete-game 4-2 loss, stayed sharp. "Obviously, I lost Game 6, and I was really upset about that," he said. "After that game, I wanted to in some way, shape or form, contribute to the team in Game 7 if that was any way possible. So after Game 6, and going back home and sleeping, I didn't let my mental side go away. I went to bed as if I was pitching the next day in Game 7. I kept that mental sort of edge in the 'on' mode." The next day, Rakuten built up a 3-0 lead, then handed the ball to Tanaka for the ninth inning. "We've come all this way because of him, so we thought he deserved it," Eagles Manager Senichi Hoshino said afterward. Tanaka allowed a pair of hits, but struck out pinch-hitter Kenji Yano with his 15th pitch -- a splitter. Game over. From there, it was on to the next challenge: facing the best hitters in the world. The first batter he faced as a member of the New York Yankees, Toronto's Melky Cabrera, took him deep. But just as he has always done, Tanaka buckled down. He won that game and 10 of his next 11 decisions, all while adjusting to a new league half a world away from home. "I wanted to come here, and I wanted to play in this league, but the communication and the language aspect was probably the biggest challenge for me," Tanaka said. "I think the really big difference is that, basically, in baseball, you predict and then you prepare. But coming here, everything was absolutely new for me, from baseball to lifestyle and all of that. It was really hard for me to predict something and then prepare toward that. So, that was the first year. But now, I really feel more comfortable. And overall, I just really feel comfortable playing the game of baseball here." Now in his third season in pinstripes, Tanaka may be comfortable, but he will never be complacent. Ever since a check-swing in eighth grade, he has been pouring every ounce of his being into baseball. He continues to evolve: this year he has nearly abandoned his four-seam fastball, has more than doubled the usage of his sinker and has moved from pitching on the third-base side of the rubber to the first-base side. The results have been typically stellar. Through June 17, Tanaka had produced more starts (11) of two earned runs or fewer than any other pitcher in the American League. "It's the process of becoming a more complete pitcher," he said. For all the ways in which Tanaka can be described, perhaps the one word that best sums him up is the same word he used to describe his diaper-changing skills. Nathan Maciborski is the deputy editor of Yankees Magazine. This article appears in the July issue of Yankees Magazine. Get this article and more delivered to your doorstep by purchasing a subscription at yankees.com/publications.